SNUBA allows you to explore a three-dimensional world you cannot enjoy while snorkeling. Swim side by side with turtles and fish along the brightly colored coral reef. Breathe through a simple to use regulator while your air supply floats on a comforting support raft at the surface. 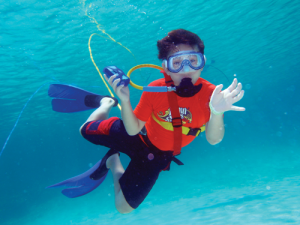 Enjoy SNUBA at any depth: At the surface, 2 feet, 10 feet, or even 20 feet! SNUBA is meant to be experienced at your own level of comfort, and your SNUBA Guide will be with you throughout the entire tour. Perfect for couples, families, children and seniors; learning to SNUBA is easy and does not require any scuba diving certification or previous experience. SNUBA is also a great way for certified divers to introduce non-certified partners and family members to the beauty of our underwater world. We invite you to join us in one of the world’s fastest growing resort activities. SNUBA is available for your enjoyment all over the world! Visit our website for a complete list of locations!